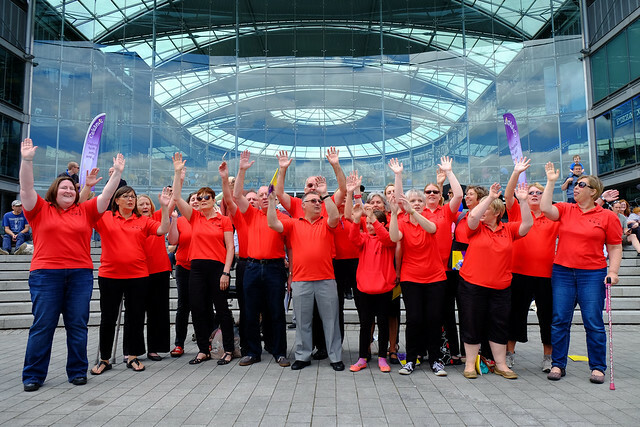 The wide range of work undertaken by the local Christian community was on display at the Celebrate Norwich & Norfolk festival in the Forum and on Millennium Plain in Norwich city centre all day on Saturday June 10. The event was opened by the Salvation Army’s Major Barry Willson, who co-ordinates the well-known nightly Norwich Soup Run, with City Crier Bob Lloyd, mayor Cllr David Fullman and Sheriff of Norwich David Walker in attendance. Barry spoke about his work and the NorfolkFeeds5000 research project which has demonstrated that the Norfolk Christian community feeds over 7,000 different people every month through dozens of different food-related projects. NorfolkFeeds5000 was also represented at Celebrate by ENYP and Hope into Action setting up a food stall to supply free smoothies, cake and soup to anyone who wanted it. ENYP director, Danny Doran-Smith, said: “We want to share God’s love for people through the message of NorfolkFeeds5000.” The stall supplied around 2,000 items of food during the day. The Celebrate event also included a Christian Social Action and Projects exhibition with Norwich Foodbank, Community Action Norwich, Mother’s Union, Norfolk Healing Rooms, Christians Against Poverty, OMF International, the Leprosy Mission and Christian Vision for Men among others. Norwich Youth for Christ organised activities for young people including a football cage, sideshow games and a programme of musical performances from its Tracks mobile studio van. There were performances from a number of singers and groups as well as the Chapel Community Choir from St Stephen’s church, the Catton Community Choir and the Thorpe Community Choir. There was also a short performance from Saltmine Theatre Company who, on Saturday evening, performed Soul in the Machine at St Stephen’s Church. Celebrate Project Director, John Betts, said: “Our focus this year was on NorfolkFeeds5000. The stories of changed lives because someone cared enough to freely give a generous food parcel, provide a meal or just give a cup of coffee, are wonderful to hear. Christians do this because Jesus calls upon us to do so and because we care for our communities. “Our aim, as we celebrate the work of the Christian community across Norwich & Norfolk, is to showcase a few of the many activities which go on 24/7 serving at all levels of our society. Frequently going where others don’t go because the love of Christ persuades us to do so,” said John. "Our sincere thanks to all those who participated in Celebrate 2017, without you it could not have happened. It was a great day for the Kingdom of God in the heart of this fine city. What a blessing to be able to stand together for Christ in the public arena to celebrate, demonstrate and communicate the work of the Church in Norwich, Norfolk and beyond." Earlier in the day, a breakfast on the subject of Christian Leadership at St Stephens church heard from Val Dodsworth from the House of Genesis, Tom Chapman pastor of Surrey Chapel, who spoke about living with a brain tumour for the last ten years and Julian Bryant from Christian Aid, who spoke about the importance of leaders getting a healthy work-life balance. See top for a full picture gallery of Celebrate or click here.